After the devaluation of the yuan, the international financial markets started trembling. Washington accused Beijing of taking advantage of the market. As China wants to incorporate the yuan into the Special Drawing Rights, it is inconvenient to prolong the devaluation. Furthermore, if a currency war broke out, China would risk increasing the economic and geopolitical tensions between countries in the Asian-Pacific region. That way, the United States would have more possibilities to disrupt regional co-operation initiatives and thereby undermine China’s rise as a world power. The three devaluations of the yuan, between 10 and 12 August, have key implications for the world economy and the geopolitical balance in the Asia-Pacific. The “relatively big” trade surplus keeps the effective exchange rate “relatively high” and therefore, it is not “entirely consistent with the expectations of the market”, specifies the People’s Bank of China in a statement. The investors’ panic will not last long. The exchange rate ends up at 6,3306 yuan per dollar and the devaluation will not increase more than 5%. Every time China shows interest in incorporating the yuan into the Special Drawing Rights (SDR), the currency basket the International Monetary Fund (IMF) established in 1969, it is clear that the worth of its currency must remain stable, as it is one of the requirements that world currencies have to meet (the dollar does not meet this requirement and as a result, it decreased 70 to 60% as an international reserve of central banks between 1999 and 2014). However, most of the Western press did not have any problem with sustaining that the devaluation of the “currency of the people” (‘renminbi’) is a way to support the export capacity of the economy deviously. Donald Trump, the favourite pre-candidate for presidency on behalf of the Republican Party, was dead set against the measure taken by the central bank: the Chinese try to “destroy” US industries. The media campaign against China is not new. 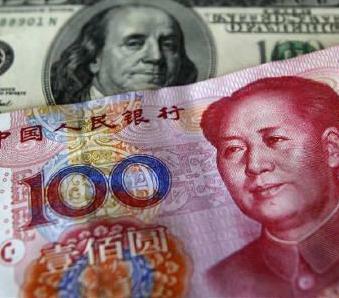 For years Washington has accused China of manipulating the exchange rate. However, the truth is that the yuan has not depreciated “artificially”, but rather appreciated itself in comparison to the US currency. Since 2005 (when the currency system became more flexible) until now, the Chinese currency has appreciated approximately 30% in comparison to the dollar, which makes it clear that claiming the devaluation of the yuan with 4,6% during the second week of August is the main reason for the US economy’s collapse is extremely exaggerated. It is true that cheap goods produced in China are sold to US citizens like never before. However, every time well-paid jobs are sorely lacking for decades, families and companies are more worried about solving debt problems than about questioning the origins of their cheap everyday products from self-service stores. Nevertheless, the US government insists on smearing the People’s Bank of China’s policy. That is not strange at all: central banks are not known for reaching agreement. History shows that, in times of crisis and worldwide turbulence, institutions responsible for monetary policy apply unilateral measures in order to move their economies forward. The US Federal Reserve System is by far the most illustrative case. Without consulting any other central bank in advance and without being subjected to Congress, its former president, Ben S. Bernanke, announced in December 2013 that the Quantitative Easing programme would be cut down. As a consequence, both the stock market and the exchange rate of emergent economies plummeted. A year later, the new president of the Federal Reserve System, Janet Yellen, announced she decided to increase the federal funds rate over the course of 2015. Even though Yellen has not yet contracted the credit (‘tightening’), currencies in the rest of world have accelerated the disaster over the last months. This situation led the European Central Bank (ECB), the Bank of England and the Bank of Japan to launching liquidity-providing programs similar to those of the Federal Reserve System to limit the increase of the dollar in respect to their own currencies. On the other hand, the People’s Bank of China has not taken any special measures, but the yuan remained stable. Why? In practice, the Chinese currency has a good relationship with the market rates of the dollar. This way, while half-way of 2014 and in the beginning of 2015, the dollar was appreciated between 15 and 20% in respect to the currencies used most in trade (such as the euro, pound sterling, yen et cetera), but only 0,6% in respect to the yuan. However, the Asian juggernaut has to overcome many obstacles. Since a couple of years, the Chinese government has implemented a series of ‘structural reforms’ so that the economy will change from an accumulation pattern that sustains on massive investment into a pattern that favours expansion of the domestic market. The big challenge of the Communist Party of China is to increase the consumption of inhabitants by increasing their buying power through salary and to decrease the centrality of savings. This turn is more necessary than ever in the light of shrinking company investments and the downfall of external demand. Last month the Chinese exportations reached 8,3% in annual terms, while its importations fell by 8,1%. That backlash is in synchrony with the extreme weakness of world trade: its expansion is at its lowest since the last 20 years. “Despite the fact that rates are still high, the growth of the Chinese GDP has also slowed down: the devaluation, however low, could reverse this tendency”, sentenced Paulo Nogueira Batista, the vice-president of the BRICS (acronym of Brazil, Russia, India, China and South Africa) Development Bank, in an interview with Sputnik Mundo. Nevertheless, it should be mentioned that Chinese co-operations export almost 60% of their goods to industrialised countries, according to Jonathan Anderson, member of the Emerging Advisors Group. Given the fact that the G-7 countries (Germany, Canada, United Stated, France, Italy, Japan, and the United Kingdom) are still immersed in stagnation and close to deflation (downfall of prices), invigoration of the Chinese economy through international trade will be complicated. On the other hand, the real estate sector starts to feel the effects of overinvestment. Promotion agencies of houses and apartments cannot find enough clients on the Chinese market anymore. The fall of sales does not permit increasing investments. As a consequence, companies that produce building equipment (steel, cement, wood, glass etc.) have been seriously damaged as they have a close tie to the real estate sector. The bank’s actions to handle the economic slowdown are very varied and not only limited to devaluating the currency. During last year, the People’s Bank of China reduced the repo rate and capital requirements of the bank system to stimulate credit granting to productive activity. Furthermore, China launched a fiscal stimulus programme, the costs of which are estimated on 12% of the GDP. The Chinese government developed a game of juggling with various balls. The Chinese try to change from an economy centred on mass investment into an economy stimulated by consumption without sacrificing its growth: they seek to stop speculation in the real estate sector (stock exchange, commodities, etc.) without cutting off the sector’s credit, they aspire to lead without coping with the financial volatility that the world market imposes. Will it be possible for the Chinese government to accomplish that? It is a big challenge. The authorities in Peking seem to worry more and more about the global panorama. The world market hastens deflation. It is not just about the instable prices of commodities and the economic stagnation with deflation that countries such as Japan have suffered since the 1990s. The deflationary crisis has consolidated in Greece and threatens to spread over most of the European economies. According to data published by Elstat, inflation in Greece fell by 2,2% in annual terms during last month, which means that deflation has been going on for 29 consecutive months now. After the Troika (established by the International Monetary Fund, the European Central Bank and the European Commission) imposed a new bail-out plan on Athens, which stimulates austerity, it is clear that deflation will eventually be stimulated and, by that, will become a death threat to Germany, China’s fourth biggest trade partner. All in all, Peking does not spare any effort to scare away from recessive tendencies that are coming to their economy gradually and that, incidentally, come as a surprise to more and more countries: from Germany, France and the United Kingdom to Canada, Mexico and South America (Argentina, Brazil, Venezuela, etc.). The regional economic context is not free from deflation either. The weakened position of the yuan is not well-received by China’s neighbouring countries. The currencies of South Korea, Indonesia, Malaysia, Singapore and Thailand fell to minimum levels after the devaluation of the ‘renminbi’, while simultaneously the stock exchange closed with a decrease between 0,5% and 1,5%. If central banks in Asia-Pacific give in to the temptation of starting a devaluation tendency by means of a beggar-thy-neighbour policy, successful convocations led by China in order to move the Asian Infrastructure Investment Bank, the Silk Road fund and the Free Trade Area of the Asia-Pacific forward will be seriously threatened. In opposition, US companies do not miss out on the opportunity to seek for the support of several Asian leaders to widen the scope of the Trans-Pacific Partnership. The Pentagon wants to use the ‘Pivot to Asia’ strategy again, this time with the military support of Japan. Without a doubt, it is a tricky plan from the United States to suffocate China’s growing influence in the Asia-Pacific. In light of the American imperial offensive, the Chinese government has to remain alert and in particular take note of general Sun Tzu’s (author of ‘The art of war’) lessons: defeat the enemy without entering in combat. «Un mapa muestra el impacto global de la devaluación del yuan», Russia Today, 18 de agosto de 2015. «Incorporate the yuan into the Special Drawing Rights», by Ariel Noyola Rodríguez, Translation Thirza Toes, Russia Today (Russia), Voltaire Network, 12 April 2015. «Get ready for yuan in IMF basket», Mike Bastin, China Daily, August 17, 2015. «China’s exchange-rate policy: Currency peace», The Economist, February 21, 2015. «Five reasons to be worried about the Chinese economy», Larry Elliott, The Guardian, August 14, 2015. «World shipping slump deepens as China retreats», Ambrose Evans-Pritchard, The Telegraph, August 17, 2015. «Devaluación del yuan puede acelerar economía china, dice funcionario del BRICS», Sputnik Mundo, 12 de agosto de 2015. «China, the Fed and emerging markets: Yuan thing after another», The Economist, August 13, 2015. «Devaluation Hints at China’s Rising Distress Over Economy», Neil Gough, The New York Times, August 12, 2015. «Markets and economics: The curious case of China’s currency», The Economist, August 11, 2015. «Greek deflation steady in July, prices fall for 29th month», Reuters, August 7, 2015. «China’s currency devaluation could spark ‘tidal wave of deflation’», Heather Stewart, The Guardian, August 12, 2015. «Renminbi fallout threatens Asian neighbours», Steve Johnson, The Financial Times, August 14, 2015. «China’s Renminbi Devaluation May Initiate New Phase in Global Currency War», Peter Eavis, The New York Times, August 13, 2015. «Currency Devaluation Shows the High Cost of China’s Soft Power», David Francis, Foreign Policy, August 11, 2015.